Please refer to our stock # TBD00117 when inquiring. A well decorated, monogrammed and marked hard paste porcelain plate. The outside border is decorated with a narrow peach ground and elaborate gilding with green dots and red lines. 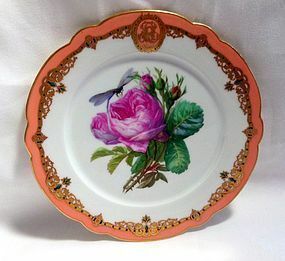 It includes a monogram dominated by the letter "R." The center of the plate is decorated with a hand painted rose under a hovering insect. The maroon printed mark, "Ch.PILLIVUYT & Cie/PARIS/EXP 1867/MEDAILLE D'OR" is printed inside a dotted oval under the base. Charles Pillivuyt was a well-established porcelain manufacturer. He won the gold medal in 1867, as is mentioned in his mark. A later mark adds another medal in 1878, so it is likely that this piece was made was made sometime between the two dates. Condition: No chips, cracks, hairlines or repairs. There is light wear to the gilding on the rim. A few knife scratches cross the rose and a little wear on the elaborate border. Very nice coloring of the rose and insect.